They were so good for while. What could be better? You make a tiny little sound in your apartment, and your headphones deliver a drum sound, as big as you like. any size drum, any amount of reverb, any tuning. A dream, yes? Well yes, but I have decided that they are no use for me and what I need to achieve. After a break of a couple of decades, I find that once again I am a serious drummer. 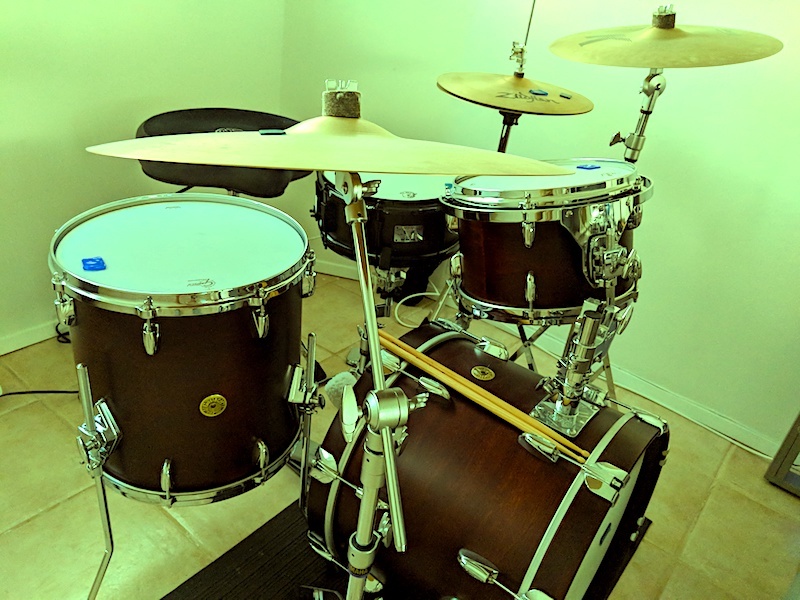 Not seeking fame and glamor at 59 years old, but seeking to improve and play at a level that I myself would find impressive if I were on the other side of the kit, listening. That has led me to turn my back on my specialty, which is Seventies-inspired jazz-rock-fusion, and focus more on jazz. Not standards, certainly not smooth-jazz, which I don’t consider to be jazz at all. But modern, forward thinking jazz. Okay it is hard to describe, but I will have some recordings online eventually. Back to the subject. Even using high-RAM Macs and top VST software, e-drums just cannot respond to the sticks well enough to perform this type of music. In jazz, the drums need to be acoustic, and ideally undamped, so they ring as they were designed to. Just the right heads, at the right tension on the right sized shells. A closed or press roll should sound like a long windy note. We should be able to play at volumes so low, they would not even trigger the module if attempted on a pad. And we need to barely kiss the cymbals with our stick tips. We need to play so softly that we can hear our breath, and then raise the volume for an enormous dynamic range. 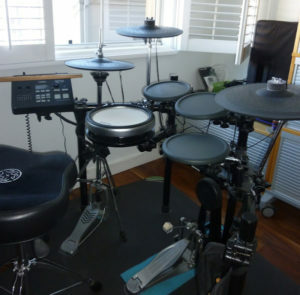 Drums, especially snare drums and ride cymbals, are complex acoustic instruments that, to date, have not been sufficiently sampled and reproduced electronically. To hear them, you have to be there in the room. And to amplify them, the microphones need to be some distance away. While the VSTs sound great, they cannot quite get this. Okay, if you play another kind of music such as rock, funk, reggae etc., e-drums are perfectly adequate. But jazz is a special case. Jazz drummers don’t keep the beat, they sing and talk with their sticks. Siri may sound human sometimes, but she is still a robot. Same with drums. Electronics are just not there yet for jazz drums, saxophones, human voice, solo violin etc. And so, since I am now trying to express myself in this way, I have a little problem. No way can I play acoustic drums at home, even a little club jazz kit. But there are rehearsal studios, with rental drums, and that is where I am headed. Meanwhile at home, I have a beautiful little thing called a practice pad, and you know, the sound it makes is very pleasing. You can hear your sticks resonate. PreviousPrevious post: Mad about M.A.D. Looking forward to hearing your latest work!